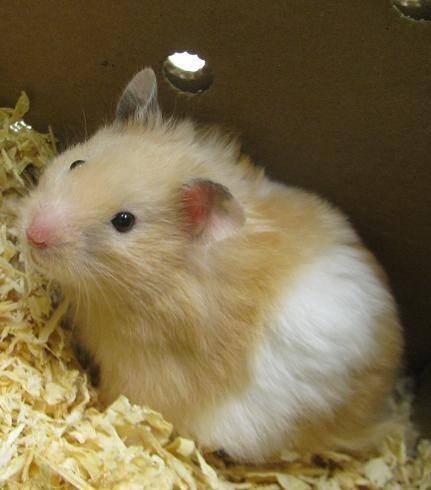 Hamsters are small, easy to keep pets with endearing faces and with frequent, gentle handling, can become tame. Hamsters are nocturnal and like many of the small rodents, need to be continually moving. The most common hamster species include the Syrian or Golden Hamster, the Chinese, and the Siberian dwarf hamsters. Hamsters have unique cheek pouches in which they store and carry food. When offered the ‘traditional’ seed/grain mix, hamsters will always choose their favourite items and leave the rest, resulting in malnutrition. Commercial pellets/blocks with at least 16% protein for growing and <14% protein for adult hamsters offers the best source of nutrition for hamsters, with seeds and grains used as an occasional treat. Food blocks can be softened with water for hamsters less than 3 weeks of age. When converting to blocks, monitor the hamster closely to ensure it is eating them before removing the seed/grain mix. Fresh food should always be washed and bits of carrot, salad greens, walnuts or apple can be given as treats. Never exceed more than 1/2 teaspoon of fresh food daily and do not offer to hamsters less than 2 - 3 months of age to avoid dietary upsets. Beware of any food that may become 'soggy' and trapped in the cheek pouch such as popcorn, bread, puffed wheat or crackers. Remember that hamsters will ‘stash’ food items in their burrow and it is important to check that the hamster is actually eating and not just ‘stashing’ food. Fresh water should be available at all times and sipper tubes should be cleaned daily and checked to ensure they are not clogged with food. Supplements are unnecessary if the hamster is on a commercial block/pelleted food. Although some dwarf hamsters form social groups in the wild, hamsters should be housed individually as once mature, they will fight if kept together. Hamsters are escape artists and since they lack depth perception, may jump from any height. 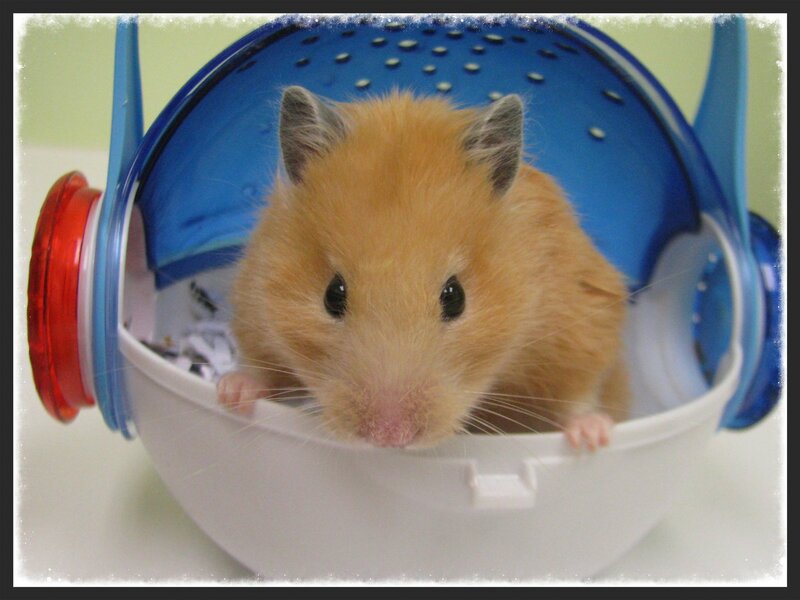 To avoid injury, ensure the cage is securely latched and do not allow the hamster to run on tables, beds, etc. unattended. Bits of kleenex, pine shavings, or paper towel are suitable forms of bedding. Avoid kaycob bedding, cedar or other scented shavings as they can predispose the hamster to illness. A hamster's cage should be cleaned every two to three days and once the hamster is over a year of age, should be cleaned daily. Provide a 'house' or box that the hamster can use as its sleeping den. Hamsters are naturally clean animals and can often be trained to use a wide mouthed jar (on its side) as a toilet area. This should be washed daily. Caution should be taken if using commercial ‘litter’ for hamsters as it can clump around the nail beds on the hamster’s feet. Avoid ‘enclosed’ cages (all plastic or glass), as the ventilation is inadequate. Environmental enrichment should provide for the hamster’s natural instincts to run, climb, burrow and chew, so including an exercise wheel, secure tunnels and tubes and toys such as chew sticks, cardboard boxes, and wooden blocks keep the hamster’s environment stimulating. Keep the cage out of the reach of other household pets. The use of plastic 'hamster balls', especially in households with other pets, is not recommended. Hamsters can become stressed with the continual motion and under no circumstances should a hamster be allowed in a ball for more than 5 - 10 minutes. Hamsters recognize their owners by a sense of smell. Hamsters are slow to wake up and should be allowed time to rouse themselves and stretch before they are picked up. It is recommended that young owners sit on the floor when playing with their hamster to prevent falling injuries. A hamster's life span is short and ranges from one and a half to three years. Hamsters are nocturnal therefore, most active at night. Hamsters have large cheek pouches in which they can carry food, nesting material or even their young. Hamsters can breed as early as 6 weeks of age, are pregnant for 15-18 days, and have 5-9 pups that will wean at 20-25 days of age. 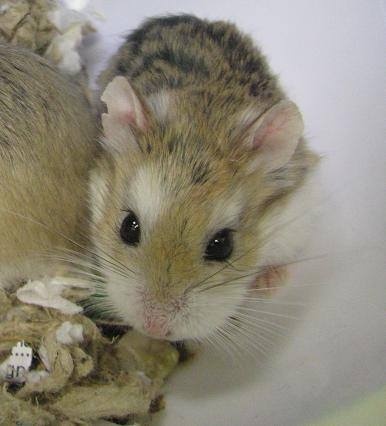 Female hamsters will cannibalize their young if they are disturbed. If the ambient temperature drops below 10 - 12 ° C, a hamster will begin to hibernate. If your hamster has trouble eating or swallowing its food, contact a veterinarian immediately. Hamsters often develop teeth problems that interfere with normal eating. Regularly note the amount of water that your hamster drinks. An increase in water consumption can indicate kidney disease. Take note of your hamster's droppings for amount and consistency. Diarrhea is a common problem and can lead to far more serious complications than a 'wet tail'. ‘Constipation’ usually means the hamster is not eating normally. Any change in the regular droppings warrants a visit to a veterinarian immediately. Hamsters can get eye infections. Watch for eyes that seal shut or have an abnormal discharge. Get used to feeling your hamster’s body for lumps and bumps. Abscesses or other growths can occur and are always best dealt with early. Monitor overall for changes in hair coat or to the skin. Remember that hamsters act instinctively and as rodents, will not demonstrate pain as obviously as other animals do, often still eating and running on their wheel despite a problem. It is recommended that all pet hamsters have health exams every six months with a veterinarian specializing in the care of small rodents to aid in early detection of problems and to allow a chance to update owners on the latest in care and husbandry.